Omg, nakakaloka yong si tito boy iniinterview si bhoy. Lol. Ikaw na! Maybe its time that we have that? How about 6 months mandatory military training and service... and taking off of ROK's mandatory military service, any male should serve once any time during their age of 23-28??? SoKor has it until 30. Beneficial rin so that we will be much prepared for future disasters, and we all know how we lack in that aspect. CAT is not enough! Problem cguro is the expense for uniform/armed equipment/daily care/health/training and such. Tapos meron pa tayong corrupt government officials na kayang kayang i-exploit ung mga soldiers, tapos mga powerful clans na pwedeng gawin ang lahat para ma-avoid ung service. Maybe its too late for this movement, kasi for sure marami ang magre-reklamo baka sabihin undemocratic tayo. Nevertheless I strongly agree for the implementation of mandatory service in the country! @kogi- yes, 1 year will be better than 6 months. That's too bad if the issue will just be the expenses. In my opinion, the government should examine and allot more on what are the most important needs both short and long term. For the past years I wished that there were more investments in education, health and in preserving our nationalism/culture not only financially but the labor force--- the people who constitute the bodies for provision of these services. Filipinos have been looking and migrating to foreign lands because of lack of opportunity as they say in their own land. They do not have enough reason to stay. So what is the point of defending our teritorries when no one will be left to stay? How many generations will still choose to be "stuck" in "hopeless" Pilipinas? Ang mga Pilipino ba ay means na lang para makapagproduce ng successors ng ibang lahi? Look at how many Fil-(insert other nationality here) are there and no they do not get back here. They write their lives on other lands. Its the foreigners who go here and "save" us. As long as its not in every Filipino's heart to care for his roots, his culture and his country, kahit 50% Hindi nya paglalaanan ng thought, lalo ng time at effort na i-nurture at i-develop ang Pilipinas--- it would not matter for him kasi he will not stay, as long as he survives in his own way, he will survive without the others. Its sad, that we have come to this. Re: The Abortion/Maternal Health Report. Sad, Cytotec is !!!! how do they get hold of that! Tne Bureau of Food and Drugs (BFAD) warns all drugstore owners, pharmacists, consumers and all others concerned against dispensing/selling and using an unregistered drug product known as Misoprostol (Cytotec). The manufacture, importation, exportation, sale, offering for sale distribution, of transfer of any drug or device which is not registered with the Bureau is considered a violation of R.A. 3720 as amended otherwise known as the "Food, Drugs, Devices and Cosmetics Act". In the interest of public health and safety, all concerned parties are hereby enjoined to refrain from dispensing/selling/using Misoprostol (Cytotec) drug and to report to BFAD (tel no 842·56·06) or police authorities any information that may lead to the apprehension of persons dealing with the subject drug. Questions: Enforcement. Restricted drugs, Controlled drugs. etc. Dear FDA. kayo na ang bahalang magdagdag at umunawa. Unahin ang Supplements na NO THERAPEUTIC CLAIMS daw but always sales person required spiel is nakakagamot daw,.promise. Lesson: We need more research. Epidemiology is the foremost necessity because excellent data gathering is a firm foundation. It is where the plans and interventions will be based. If only lay people can learn about Pharmacology, Pharmacokinetics and Pharmacodynamics from health professionals na walang conflicts of interest. Hashtag I recommend to you, You buy from Me. Forecast: Nephrology and Hepatic Care in the Future. What you put inside your body goes through your liver and is filtered by your kidney. freedom from pain is not curing/eliminating the root cause. Trust me, I know. we all know someone who has a disease with no cure. B. Us, we can rest our minds, our souls free of guilt to have exhaust all means, because we cannot NOT do something!!! A. Them. there is a possibility of prolonged life with us, even in gulay form. B. Us. you can stay with us still, because we are not ready to let you go, its too early to let go of you. Safety on the Internet. Agree that many people give out Too much Info on the net and know not how to filter or discriminate on which sites to disclose essential info and those not to be trusted with such details. Mostly on the younger people and even the old old. Ms. Jalandoni's report on the WHO updates on recommended daily sugar intake. Many people suffer from Diabetes and its complications - kidney failure, cardiovascular disorders etc. Mortality and morbidity reports reflect as such. Even in your neighborhood or kakilala, there's someone who has it. I have handled patients with Diabetes in both community and hospital. my paternal grandfather died from Diabetes Mellitus (to be more specific Ketoacidosis and Respiratory Failure eventually due to acid base imbalance) when I was younger. I could grasp the mechanisms of how it happened in and outside of the body even without equipment. He died in his sleep, he was 86. The only consolation was that he did not have other comorbidities neither did he experienced kidney failure. In the community I was supervising a patient who both have active TB disease and DM- a more complex scenario because the more sugar in your system, the more nourishment for the bacteria. Microbiology and biochemistry application with pathophysiology here. So it was essential that the DM be controlled, as with other patients with other diseases aside from DM. Sugar is such as food for organisms, simplest example is diabetic foot. The more favorable niche for them to replicate. Increased sugar in the system is associated with delay healing. And that adds to the burden of illness. Matatamis pa naman tayo magsikain. Lifestyle modification talaga. Eat in moderation. Unless trip mo and gusto mo ng Capillary Blood Glucose Every Two hours, insulin Turok sessions, hemodialysis and kidney transplant. Hopefully the problems with the Fire Hydrants be addressed as soon as possible. Summer is approaching, mas mainit na temperature, then the need for electrical appliances to alleviate ang init, more prone sa mga sunog. Kahit complete ang equipment ng Fire Trucks and the firemen too kung walang water, pointless din. Nakakalungkot yung mga bagay na existing pero hindi functional/na-u-utilize. Like yung roads sa pier/north harbor. Basketball arena ng mga tao dun. Magkano ba ang ginastos doon? Sino ang gumastos doon? Alam nyo yung feeling na sumasahod ka over lang ng konti sa minimum wage kaya kailangan mong magbayad ng income tax (at yung mga walang sweldo na tambay ay hindi) tapos gagawing basketball area ng tambay yung pinondohan ng tax mo? Long battle pa talaga. Ang hirap pa naman sa mga bata, poor ang cough etiquette. And ang hands kung saan saan humahawak. This is a concern for everyone. Hindi yung my TB lang. If you put that person with TB (hindi sya diagnosed or may symptoms but not seeking treatment) in the middle of a circle of people, ilan ang mahahawa nya. at ilan ang mahahawa ng mga nahawa nya? The TB bacteria is an acid fast bacilli. It has a coating that protects it that makes it last longer than other organisms. Sunlight will help kill it. Well... slums sa Pilipinas. See the importance of drying your clothes and articles under the sun? and the distance also matters. Imagine kung ang mukha ninyo sa LRT or jeepney dikit dikit na... 1-3 feet ay critical distance sa transmission ng bacteria/agent. kawalan ng ventilation equals happy bacteria. And then the pollution too, which weakens the lungs. So all these elements combined (*Captain Planet! *) results to favorable conditions for attack and colonization of harmful agents that will lead to illness. Dapat na talaga yung environment friendly mode of transpo. Alarming yung 7 million deaths in a year due to pollution report ng WHO. Paano ba yang fare na yan? Hindi nga madetermine nang maayos kung ilanan ang jeep eh. Yung kalahati lang ng buttocks mo ang nakaupo tapos 8.50? kung pwede lang lumipad or mag apparate eh 'no? pag private vehicle naman, traffic and oil price ang kalaban mo. how frequent do you have your employees in the house checked? do you have your employees checked (x-rays :Chest X-Ray PA:, at least)? there was a time my mom saw "ate" cough and there was blood on "ate's towel and my mom had had her checked for confirmation but mom already can deduce (and it was confirmed later) that "ate" has TB. upon talking to her it turned out her TB is a relapse. Its bad enough that she has an active TB disease but having relapse is worse. we took care of the treatments she needed, and our family had ourselves checked too. I remember being out of the class earlier several times, with permission from school, and my classmates were all eyes on me as I walk out of the room. I went together with the rest of the family and our other kasambahay straight to the hospital and have had regular check up/follow ups. I remember having reddish urine because of one of the drugs. I remember the time my baby sibling cry because of the Mantoux test. I remember the times that "ate" was clearly having clouded mental judgment because of her condition and maybe because she was getting depressed too while undergoing the treatment, she was worrying that she will lose her job, but we didnt fire her, instead let her stay while she finishes her treatment but of course she was not allowed near us kids anymore. I remember her arguing with me over the simplest of things. She became easily irritable that at times our other kasambahay turned to take care of her as I turned to care for my younger siblings. "ate" refused so many times to be taken to the hospital. She got better physically- she gained weight as was expected results of early phase of the treatment but that was the calm before the storm. one early morning when both of my parents went to work, I was frantically woken up by our other kasambahay. she said "ate" is coughing up blood. I went to the kitchen but stopped short to maintain a certain distance and saw "ate" there. she was coughing out blocks of blood. our other kasambahay went out to get help as I call my mom and dad. the neighbor's kasambahay was carrying my baby sibling and we both are helplessly looking on to "ate" endlessly coughing out blood until she collapsed onto the ground, unconscious. Help came, she was rushed to the hospital and could not be revived. We told her family. The family disclosed that "ate" indeed had been diagnosed with TB before. Even worse, she was not able to complete her treatment then, hence the relapse on her stay with us. We left our house for a few years. Had it cleaned, disinfected. Had the kitchen renovated. Then we went back. For a few days I was afraid to go to that the spot of the house. I was 8. I can still remember vividly the pool of the blood on the floor. The blocks of blood on the sink. I remember every detail. It was horrible. It haunted me in my dreams before. buti ngayon may DOTS na. its free sa health center. WHO pa galing ang supplies. have your people checked. I posted this hoping that you can take measures for yourselves. I hope not another baby be exposed to such infectious illness. I hope not another child witness such event. Alam n'yo ba yung FALSE HOPE? biglang ipapasok uli sa facility? i-intubate, na-coma dahil sa acid-base imbalance, hindi kinaya ng compensatory mechanisms. interviewhin mo ang kamag anak, nag-take daw ng herbal/juice pag uwi! itatanong mo kung anong herbal, ayaw sabihin ang tatak. nakaka-ilang acid/base post na ba ako sa forum na ito? 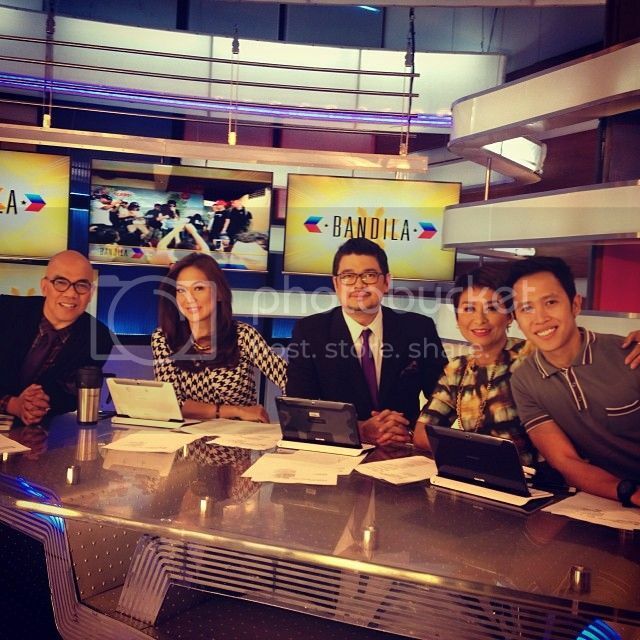 Is Bandila reformatting on 12 May 2014? Are they moving to a new set? Ampanget-panget ng Bagong Theme Song ng Bandila, promise. Mas maganda pa rin yung kay Rico Blanco.